• Right-hander Marco Estrada will get the start for the Toronto Blue Jays today on his 32nd birthday. His birthday present: he gets to pitch against 2011 American League Cy Young Award winner Justin Verlander. For the record, this will be Estrada’s first big league start and second appearance on his birthday. He pitched two shutout innings in relief for the Milwaukee Brewers on his birthday in 2011. 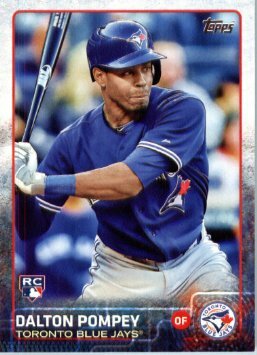 • Here’s something that I somehow missed: the Toronto Blue Jays selected Chicago Cubs rookie sensation Kris Bryant in the 18th round of the 2010 MLB amateur draft. The 6-foot-5, 215-pound third baseman elected to attend the University of San Diego rather than sign with the Jays. The Cubs then selected him second overall in the 2013 draft. The 23-year-old has socked 12 home runs and posted a .381 on-base percentage in 70 games for the Cubs this season. • Just how good has Josh Donaldson been for the Blue Jays this season? Well, I offer this June 28th tweet from The Score MLB news editor, Dan Toman, “Josh Donaldson has been worth more wins (4.1) in three months than Brett Lawrie’s final two seasons in Toronto combined (3.2).” By wins, Toman is referring to Donaldson’s WAR (Wins Above Replacement), an all-encompassing statistic that measures the numbers of wins a player (taking into account their offensive and defensive contributions) adds to their team above a replacement level player (Triple-A player). • Dear Blue Jays fans: About that potential Matt Boyd for Jonathan Papelbon trade, never mind. • After struggling in the big leagues and at triple-A early in the season, Mississauga, Ont., native Dalton Pompey has rediscovered his mojo with the Blue Jays’ double-A New Hampshire Fisher Cats. The fleet-footed outfielder is batting .384 and has belted six homers in 23 games for the Cats. • Bill Stoneman, the only pitcher to throw two no-hitters for a Canadian major league team, has agreed to serve as the interim general manager of the Los Angeles Angels after Jerry Dipoto resigned on Wednesday. Stoneman, who tossed two no-nos during his tenure with the Montreal Expos from 1969 to 1973, was the architect of the Angels’ 2002 World Series-winning squad during his first tenure as the club’s GM from 1999 to 2007. What’s less known about Stoneman is that he returned to Canada after his playing career in 1974 and worked in management roles for Royal Trust before he accepted a position in player relations for the Expos in 1983. The following September, he became the Expos vice-president of business operations and in August 1987, he took over as the club’s general manager when Murray Cook was fired. • In my continuing review of the 1977 Toronto Star archives, I found a list of the salaries of the players in the Blue Jays’ Opening Day lineup from their inaugural season: Rick Cerone, C, $25,000; Doug Ault, 1B, $19,000; Pedro Garcia, 2B, $30,000; Hector Torres, SS, $27,500; Dave McKay, 3B, $25,000; John Scott, LF, $19,000; Gary Woods, CF, $19,000; Steve Bowling, RF, $19,000 and Bill Singer, P, $90,000. The average MLB salary in 1977 was $92,953.63. Singer was the highest paid Blue Jay at $90,000. • With evidence surfacing that Pete Rose allegedly bet on baseball as a player, the sport’s all-time hit king is back in the headlines for the wrong reasons. With that said, I thought it would be fun to look back at his first game with the Montreal Expos. That took place against the Houston Astros at the Astrodome on April 3, 1984. Batting leadoff and manning left field for the Expos, Rose went 2-for-5 with a run. What stood out to me about the box score for that game was that there were five Canadian Baseball Hall of Famers toiling in it, including Tim Raines, Andre Dawson, Gary Carter and Tim Wallach hitting back-to-back-to-back-to-back in the Expos lineup. The pride of Melville Saskatchewan, Terry Puhl, batted second and patrolled right field for the Astros. The Expos won 4-2 in front of 28,505 fans. • This week’s trivia question: Bill Stoneman pitched the first two no-hitters in Montreal Expos history, but can you name the other two Expos pitchers that tossed no-hitters? Please provide your answer in the “Comments” section below. The first person to provide the correct answer will win a 1981 Topps Tim Raines rookie card. Nice work, Bill. This was probably an easy one for you 🙂 I’ll get in touch via e-mail. David Palmer threw five perfect innings at St. Louis on April 21, 1984. At the time, it was recognized as a no-hitter. In 1991, MLB’s Committee for Statistical Accuracy changed the definition of a no-hitter to include only those games that last nine innings or longer. That was a rain-shortened game, I meant to add. Thanks for adding that piece of trivia, David. I had forgotten about the Palmer “perfect” performance. Big City Barry: You’ve got one of them right. Bill already had the correct answer above. It’s Charlie Lea and Dennis Martinez. Thanks for participating. Gardner’s was two days before Dennis Martinez’ perfect game. Pedro Martinez, of course, threw nine perfect innings at San Diego June 3/95. Thanks, David. Yes, we can’t forget Pedro’s performance. Thanks again. Nice stuff Kevin, hope you’re well. Thanks, Brent. Hope you are doing well too. Thanks for info and trivia. Keep up the good work. Thanks, Devon. Technically, Bryant was never with the Jays. He was drafted by them, but he never signed with them. Thanks again for the comment.